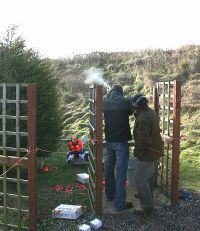 'Clay Pigeon Shoots' has been set up to offer the absolute best value for money clay pigeon shooting experience. We cater for individuals and groups of people based at our shooting ground north of London between Luton and Milton Keynes, 45 minutes from central London and easily reached by rail on the First Capital Connect. Who else will offer you a money back guarantee that they will get you to hit targets and send you home with a comfortable rewarding experience? We have been teaching clients to shoot shotguns for over 25 years, and experience has taught us that a session consisting of 50 clays is the ideal package. This allows us the time to teach you to shoot safely and comfortably and present you with differing targets and challenges. This will ensure everyone goes home with a sense of achievement and that 'value for money' feeling. The price is £60.00 per person and includes a professional shooting instructor, all cartridges and clays, use of all equipment. Sessions can now be booked at Luton Hoo Hotel Golf & Spa, Bedfordshire. Prices start from £95.00 and includes tea and coffee on a help yourself basis. Birthdays, Stag & Hen Parties, group of Friends, Individuals, Gift Vouchers, all occasions catered for. 'Clay Pigeon Shoots' can be found north of London just off M1 J12 which is easily accessible from the Home Counties including: Beds, Bucks, London and Milton Keynes. The nearest train stations are Luton and Harlington (2 minutes away) with direct services from London.